2013 Road Trip Photos #11: Inside the Adams Family Crypt « Midlife Crisis Crossover! Once we were safely and successfully on the road again after the morning’s mechanical failure, our Day Four officially commenced due south of Boston in the town of Quincy. (Official blending-in tip for outsiders: it’s pronounced “Quinzy” by the locals, because that’s how the eponymous family pronounced it.) In the basement of the United First Parish Church lies a very special room open to any and all visitors, though they do suggest a donation, and — based on the bizarre, unexplained incident we witnessed — will turn you away at the door if you prove yourself a local, recurring, foul-mouthed nuisance. 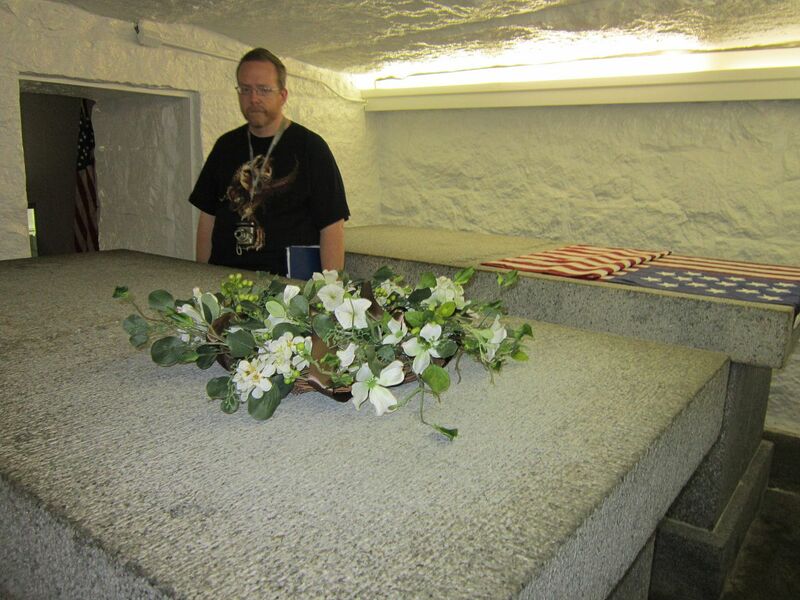 Inside that bunker-esque room lies the final resting places of four noteworthy historical figures: John Adams, second President of the United States; his wife/First Lady, Abigail; his son, John Quincy Adams, our sixth President; and his wife/First Lady, Louisa. This stop was undeniably a huge draw for my wife the history buff. She found David McCullough’s John Adams biography engrossing, and appreciated the majority of director Tom Hooper’s HBO adaptation of same. When we decided on Massachusetts for this year’s family road trip, Adams’ hometown of Quincy was an automatic front-runner on our to-do list. 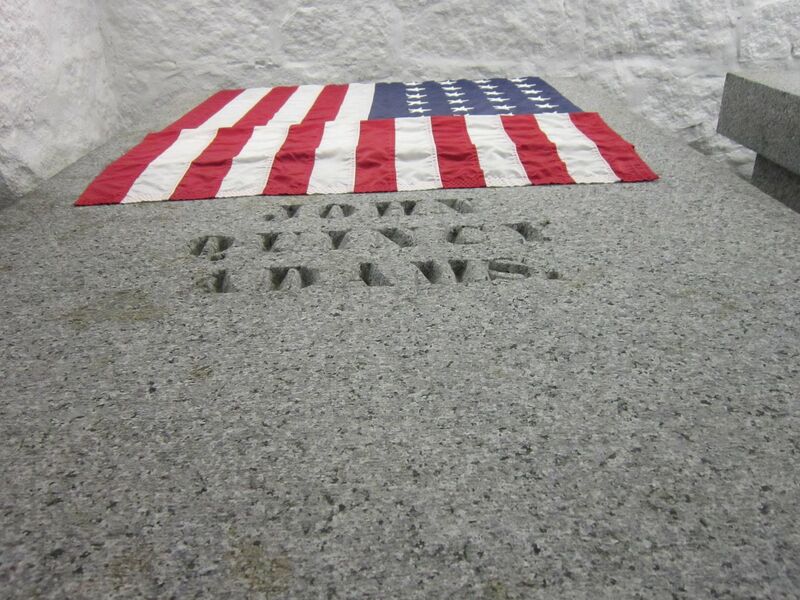 This wasn’t the first place the elder Mr. and Mrs. Adams were buried, but John Quincy would later arrange for their transfer and reinterment here beneath the United First Parish, whose present structure they helped finance. 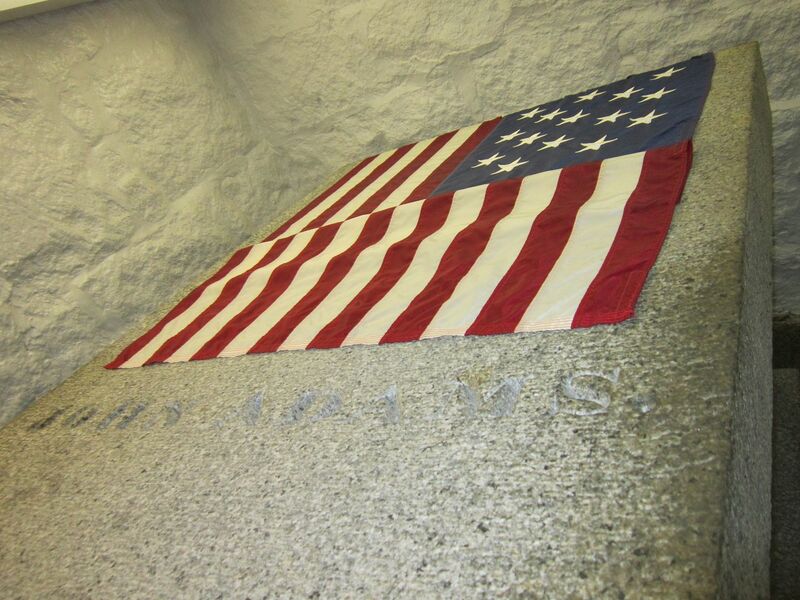 Years later, the crypt was expanded to twice the size in order to accommodate John Quincy and Louisa at the behest of his own son, Charles Francis Adams. 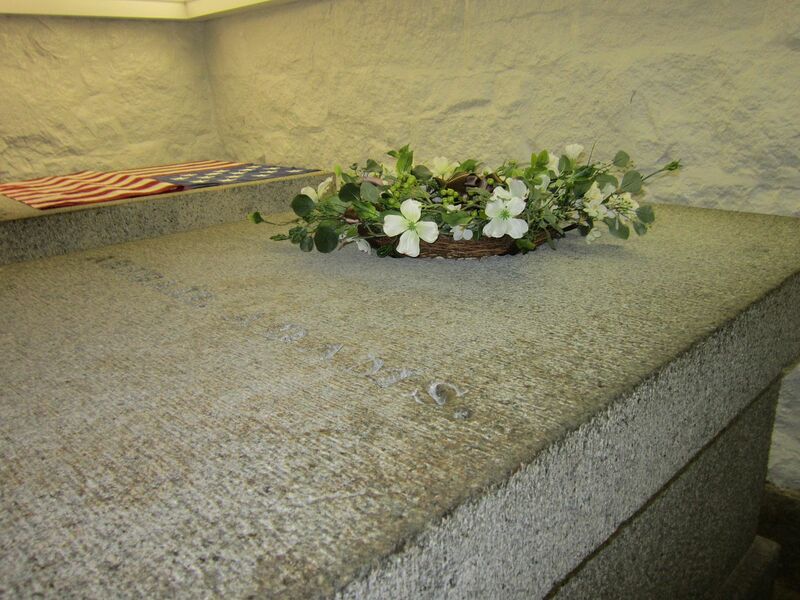 The Adams crypt permits a shockingly front-row viewpoint of their tombs, in which visitors can stand right next to them. 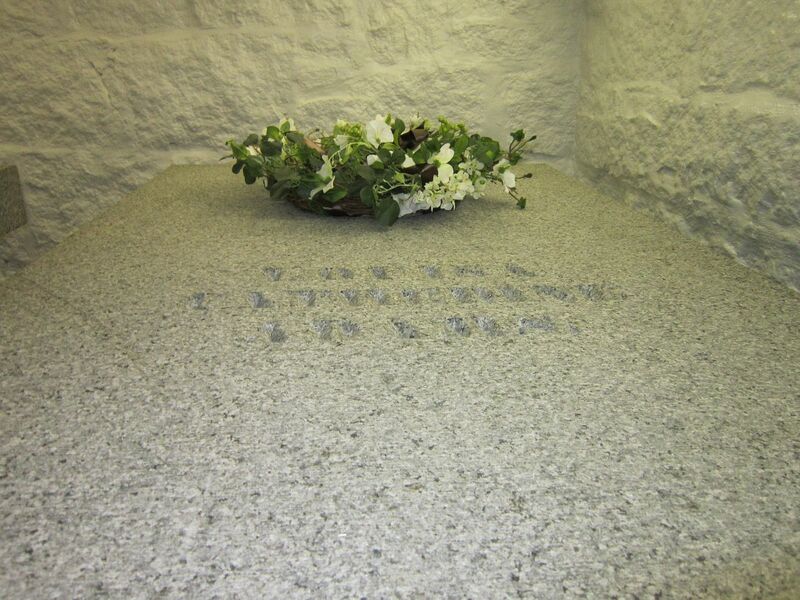 That’s a remarkable contrast to other Presidential burial sites we’ve visited — e.g., Thomas Jefferson’s flowery, heavily fortified plot in Monticello; staggering Grant’s Tomb in Manhattan; the partitioned chapel on the grounds of Eisenhower’s complex in Abilene. Here, two Presidents and two First Ladies rest together as a family and You Are There. The hardest part of the experience is the claustrophobic vault itself, whose designers had no motivation to keep tourist photography in mind while drawing up the blueprints. All possible vantage points are awkward and cramped. 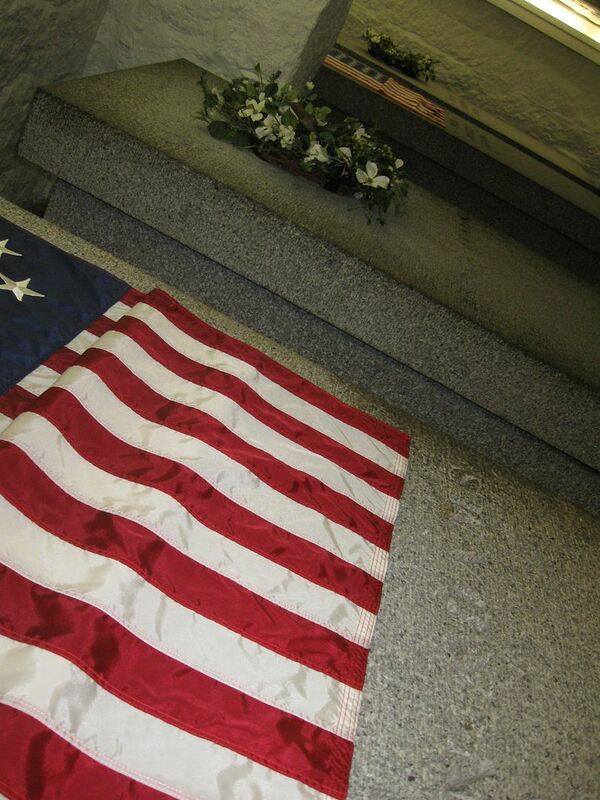 Not that crypts should provide a foyer and snack tables, but it complicates the process of sharing images with those interested American history buffs who’ve never been there and may not be dropping by the area anytime soon. The following photo is provided solely as a framework for spatial comparison. You can see the undertall doorway, the low ceiling, the formidable tombs themselves, a fleeting glimpse of the hallway, and the odd look on my face as I think to myself that perhaps I could’ve dressed a little more appropriately for the occasion.